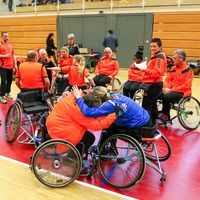 Following the successful 2015 European Wheelchair Handball Nations' Tournament in Austria last year, the planning for the event's next edition is already underway. The 2016 tournament will take place on 7 and 8 December in the Swedish city of Sölvesborg. The European Handball Federation now calls for participants. All member federations have the right to participate, however the event is limited to a maximum of six teams which will be registered following the "first come, first served" principle. All teams shall be mixed (male and a minimum of three female players) with always one female field player on court. Only one not-disabled player shall be present on the court per team. The registration has to be submitted by the respective national federation. The deadline is 15 October 2016. All information as well as the registration form is available for download as pdf. For further clarification on the playing rules also refer to the document "How to play wheelchair handball".